It’s that time of year again! We usually prank our kids, but my daughter came to me a couple weeks ago and wants to get her dad. Since I was coming up with some ideas for her, I thought I would share them with y’all! 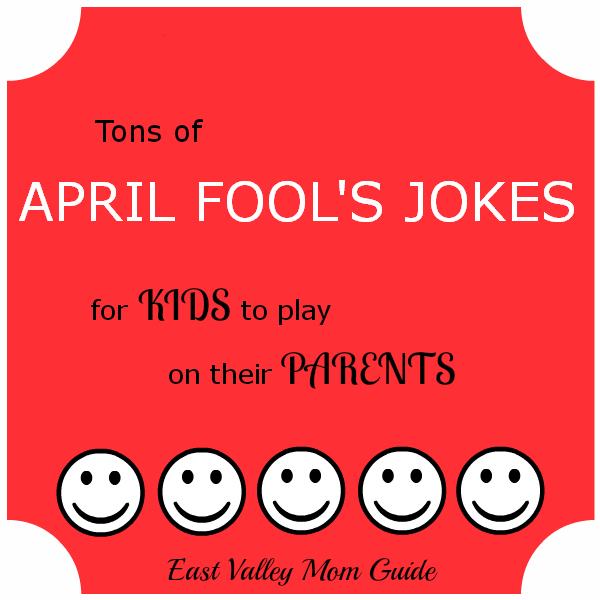 These April Fool’s jokes are for kids to play on parents…that means you or their other parent with your help. Have fun! 1. Put a rubber band around the sink sprayer and let your parents wash their hands. Stand near by to watch their reaction. But beware of cleaning up the water that didn’t get them! 2. Put a rubber band around the push button of the spray nozzle (the kind with a hose) so the button stays down. Point it forward. When your parent uses the sink they will get a wet surprise! 3. Set parent’s alarm clock for the middle of the night and hide it somewhere in the room where they will have to get up and scramble around to turn it off. 4. Move the time on your parent’s clock up an hour. Best done after your parents have gone to bed. 5. If your parents have a traditional phone with a hook that presses down when the handset is in the cradle, tape it down. When they answer a call it will keep ringing. 7. Make a sandwich for your parents, but don’t remove the wrapper from the slice of cheese. When they bite down they’ll get a chewy surprise. 8. Stuff some cotton into the toes of your parents’ shoes. They will think their feet grew or their shoes shrank. 9. Take all the cereal in the house, remove the plastic bags from the boxes, and switch them around. When your parents try to eat breakfast they will do a double-take when the wrong cereal pours out. 10. Get up a bit earlier than your parent and take the cell phone and tape it underneath their chair at the kitchen table. Then, when they are eating breakfast, call their cell phone and watch the reaction. They will look everywhere for that phone and will not think of looking under the kitchen chair! 11. Sneak into Dad’s underwear drawer and safety pin all of his undies together side by side. When he pulls out one pair, they all come out! 12. Take a screenshot of the desktop on Dad’s computer, and leave the image open. Let him freak out for a few minutes, believing the computer is frozen. 13. Swap out sugar for salt and watch Dad put it in his morning cup of coffee. (Be nice and have a second, non-salted cup ready to go though). 14. Get some clear plastic wrap and completely cover a door way. Be sure your around to see the face as your mom or dad walks into it. 1. Clean the house and do the dishes. Fill the car with gas and wash it. 2. Cover car with hundreds of post it notes. 3. Take the top sheet off parents’ bed, and tuck the bottom end under the top end of the mattress. Pull it down and then fold it back up so that the top end is where it would be if the bed was made normally. Replace the pillow, blanket, etc., and make up the bed like it was before. When your parents get into bed, they’ll be surprised when they can’t slide their feet all the way down to the bottom of the bed! 4. Buy a package of “hair extensions” that match your parent’s hair. (Look for inexpensive ones in the hair accessory section of a drug store or grocery store.) Snip some strands about the length of your parent’s real hair and spread it around on their pillow while they are asleep. They will wake up to a real fright! 5. Buy a pack of underwear that matches those that your parent usually wears, but make sure they are one or two sizes too small. Wash them a few times so they don’t look new. When your parent puts them on, on April 1st, they will think they’ve put on a few too many pounds. Wendy is married to her high school sweetheart, is a mom to 2 children, and lives in Mesa! She shares her family friendly recipes at Around My Family Table. Live threw her a curve ball after a life threatening dairy allergy and wheat allergy emerged in 2012, so now many of her recipes are gluten and dairy free. When she's not cooking find her on Pinterestor Instagram! Read more about Wendy here! It would be a good prank though because if you are, like, a lazy teen, then your parents would be pretty surprised to find all of the chores done. And it would be pretty fun to watch their reaction. I am going to do this on my parents!! My daughter liked the one when you put coton in your parents slippers she is going to put it in her dads slippers and boots. OMG OF COURSE I’M GOING TO DO THESE! Ya this stuff is great. I now have lots of cool pranks to do on my family or friends. Yes kids can’t do this it is bad !! I’m only ten to my mom would freak out if I did any of these. It is not bad it is just kids having fun on April Fools Day!!! Me too. This is Genius!!! You should use a mouse and plug it in someone’s computer. See what they do when you move your mouse around. I’m so gonna do these tomorrow for my parents!! LOL I love this website and I’m about to do the sticky note one. Do you know what a big mess I would have to clean up… Not counting the punishment! Yet I will still do it! I am going to do the spray nozzle trick all of these sond good but aren’t really helpful I’m 10 my parents are more old – timey thanks anyways though! me too I thought that was funny!!!!!!!! The one with the teens; wash car and put gas in it. Clean the dishes and house. That one cracked me up! My mom’s so picky with April fools pranks she wouldn’t let me do half of those !! These are awesome can’t wait to try them. I am difedently going to do this to my parents. I have two younger siblings and I am going to have them help with the schemes!!! Same, I might try the cotton or the underwear one on my dad. It will be so funny!!!!!!!!!!!!!!!!!!! these are really great suggestions!!! i am a kid so i am going to do one prank on my mom and dad. Omg I am defenetly using the hair on the pekoe one!!!! !